The Ultimate Keekaroo Peanut Changer Review: Will You Love It? There are a lot of things parents don’t realize they need until they actually need them and a portable changing pad is one of them. More specifically, the Keekaroo Peanut Changer is a strong contender for a pad that you can use for your infant and take with you on the go if need be or simply use at home. As any parent can attest to, there are countless times when you might find yourself laying a blanket down on the living room floor to do on the fly diaper changes because who has the time or energy to walk to the changing table in the nursery every single time? With the Keekaroo Peanut Changer, you can deal with diaper changes pretty much anywhere without worrying about putting your baby on a hard or unsanitary surface. In fact, the Keekaroo Peanut Changer has an easy to wipe down a surface that doesn’t absorb water and can easily be disinfected anytime you clean it. And since it’s both scratch and puncture resistant, you won’t have to worry about unsightly cracks allowing moisture to seep in. The shape and design of the changing pad are meant to keep your baby safe and comfortable throughout all diaper changes and the upraised sides mean your little one isn’t likely to roll off. It’s also slip resistant, so if you want to use it on a hard surface, it won’t slide off and to further speak to the safety of the Keekaroo Peanut Changer, it has a buckle to keep your baby in place while you change his or her diaper. You can purchase it on the manufacturer’s website and on Amazon or in store at Buy Buy Baby. On Amazon, the Keekaroo Peanut Changer is $129. Check out the latest price! It features a non skid material and safety buckle to keep your child from sliding or moving around when you have them in the changer. The top layer of the pad is made from a crack resistant and wipeable material that makes it easy to clean. Because the material cannot be easily penetrated, there’s less of a chance of bacteria build-up or mold. It’s suitable for babies up to 30 pounds. On its own, the changer weighs just four pounds so it can be moved around as you need it. The dimensions are 32 x 17 x 4 inches. You can keep the changing pad in your room for easy middle of the night diaper changes so you won’t have to rush your baby to the nursery if he or she sleeps in your bedroom. There’s little to no chance of mold or bacteria building up inside of the pad over time. To clean it, you just wipe clean the surface of the thick foam pad and that’s it. Since it’s so lightweight, you can move it around your house or even take on family trips so you won’t have to worry about finding a makeshift changing table. You won’t need any covers for it, which means you won’t need to worry about washing changing pad covers and keeping fresh ones handy. At first, you might notice a strong chemical or plastic smell that doesn’t go away right off the bat. When it’s colder outside, the pad is naturally cooler to the touch, which can be uncomfortable for some infants. The size might be a selling point for some parents, but others may find it almost too big or bulky. If you’re at all familiar with the Bumbo Seat, then you’ll probably respond just as well to the Bumbo Changing Pad, which seems to be made of a similar durable foam material. It has contoured support on two sides to keep your baby safely within the short walls of the pad and you can use it for diaper changes or even just for playtime on the floor since it’s that comfortable. Like the Keekaroo Peanut Changer, you can simply wipe clean the Bumbo Changing Pad and take comfort in the fact that its durable foam makes it hard for moisture to get through and cause mold or bacteria to build up. The weight capacity is also 30 pounds and the changing pad is less than four pounds with dimensions of 27.2 x 17.1 x 3.7 inches. You can find it on Amazon and in-store at Buy Buy Baby and on Amazon, the Bumbo Changing Pad is $70. Check out the latest price! 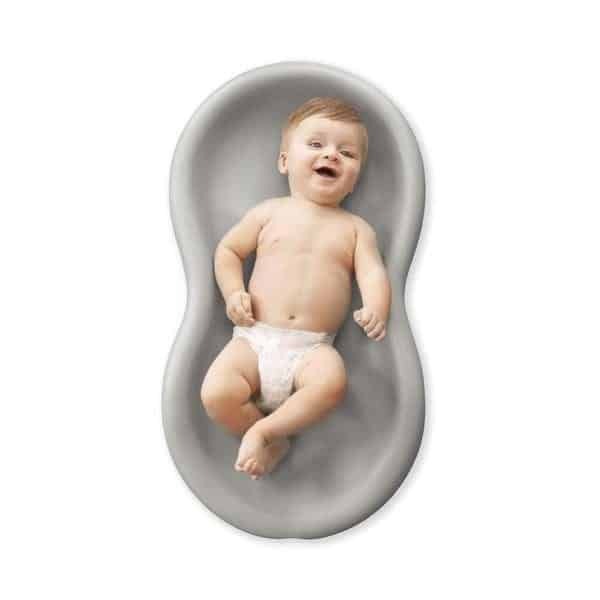 The oval shape of the changing pad is ergonomic and can easily fit your baby. There’s a non-skid bottom thanks to the material it’s made out of and also a buckle to keep your baby safe. There’s also a slight slope on the changing pad so if your child urinates while you have them on the pad, then the urine will most likely flow down the slight incline instead of the pool beneath your baby. It’s almost half the price of the Keekaroo. After some time, the color might start to rub off on the changing pad. Depending on your child’s height, their legs might be too long to comfortably lay on the changing pad without their feet hanging off the end. Some parents might feel as though the non-skid bottom needs reinforcements in order to truly not slide on a smooth surface. The Hatch Baby Grow Smart Changing Pad might look similar to the Bumbo and Keekaroo, but it also has a built-in scale to help you wirelessly track your baby’s weight and growth between doctor appointments. There’s no guarantee that you’ll truly use this particular feature, but it convenient to have with a changing pad that’s comfortable enough to keep your baby lying still. You can also wipe clean the changing pad to keep it sanitized and it doesn’t have the need for any changing pad covers to deal with. The oval shape and gray color are definitely aesthetically pleasing for any nursery and like other similar foam changing pads, you can use it in other rooms of your house and not just the nursery. The pad itself weighs 7.5 pounds and its dimensions are 29 x 16 x 3.5 inches. You can find it on the manufacturer’s website and on Amazon or in store at Buy Buy Baby. And on Amazon, the Hatch Baby Grow Smart Changing Pad is $130. Check out the latest price! It has a removable safety strap that can be placed in a drawer when it’s not in use, so you can keep it out of your little one’s hands. The shape and design of the changing pad make it comfortable for your baby to allow you to change their diaper every time instead of trying to squirm away. Although it’s debatable if you’ll actually use the scale, if it’s important to you, then it could be an ice way to give you peace of mind when you’re between doctor visits. To clean it, you just need to wipe the surface clean. Even though it has a built-in wireless scale, you may not actually end up using it each time, which makes the cost not necessarily worth it for some parents. At 7.5 pounds, it might be difficult to move the changing pad from room to room. The material itself might feel cold to the touch for babies. There aren’t many big aspects of the Skip Hop Nursery Style Wipe-Clean Changing Pad that totally set it apart from some of the others on this list or even the Keekaroo Peanut Changer itself, but it does have some fun features you won’t find anywhere else. For starters, the changing pad has a small detachable mobile to help your child feel comfortable and at ease during diaper changes. 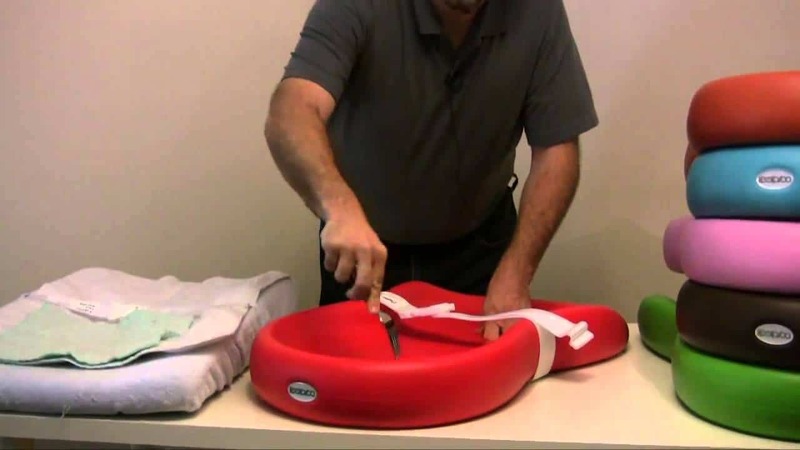 It also has the requisite safety buckle to keep him or her securely fastened on it, as well as a tabletop attachment to securely attach the changing pad to a surface instead of relying solely on the non-skid bottom. It can support babies up to 30 pounds and on its own, the changing pad is five pounds. Its dimensions are 31.5 x 18.2 x 2.6 inches and you can purchase it on the manufacturer’s website and on Amazon or in-store at Buy Buy Baby. On Amazon, the Skip Hop Nursery Style Wipe-Clean Changing Pad is $89. Check out the latest price! Not only is the base meant to be non-slip, but the changing pad also has a tabletop attachment so you can attach it to a dresser or changing table surface. Cleaning it is as simple as just wiping it down. There’s a detachable toy bar mobile to keep your baby entertained and happy during diaper changes. The pad itself is soft enough for most babies to feel cushion beneath them rather than a hard surface. Some parents might find the Ship Hop changing pad to be bulky, heavy, and difficult to move around. Compared to some other similar changing pads, it gets scuffs and scratches more easily than others. It can be difficult at first to figure out how to collapse or remove the toy mobile. If this Keekaroo Peanut Changer review tells you anything, it’s probably that the changing pad isn’t exactly the most unique or one of a kind item in the world. But what it should also tell you is that the Keekaroo Peanut is also so convenient and handy for any parent who is still going through the diaper phase with their baby. Granted, your baby must be 30 pounds or smaller in order to get use out of the changer, but the pad should still take you through the majority of the diaper days in your household. Other similar changing pads might be made of similar safe material and remain non skid to keep your baby safe, but the ergonomic shape of the Keekaroo Peanut Changer and the overall benefits and convenience it provides are hard to ignore and, in some cases, hard to perfectly match. The price might not be your favorite aspect of the changing pad, but then again, with baby accessories and necessities, you get what you pay for. In this case, you get a durable and easy to clean baby changing pad that can be used for quite a while before your baby will grow out of it. Britax Pioneer vs Frontier Car Seat [March 2019 UPDATE] | Which Britax Car Seat is Best?